Developing or Designing Blogger Template is not easier. But this comprehensive Blogger Theme Development's guideline with separate tutorials will help you to create a Blogger template from scratch STEP-BY-STEP. You will have been found Blogger template designer software on Google search but those has many limitations for that you don’t like this. 1. You are compelled to choose the given design example: menu, layout, etc. 2. You won’t learn how to code on a blogger template in future. So you can’t customize your template where it is needed. 3. You won’t learn the basic structure of Blogger template etc. But this guideline will make you success to create a full responsive, professional and custom Blogger theme or template that will be installed successfully and your visitors will see the changes what you will do now. Thinking about publishing post to own designed and developed blog is just about thrilling, isn’t it? 1. HTML/CSS Editor. Off-line is recommended. Notepad++, Sublime Text, Dreamweaver, Geany etc. On which you prefer to code. 2. Notebook to save the essential codes, tips etc. Probably, you had tried to upload your designed HTML template on Blogger manually or copy-paste. But every time you failed to see the changes because many errors are shown on notification bar in Blogger HTML Editor. Today you won’t be failed to see your designed HTML template through Blogger platform. 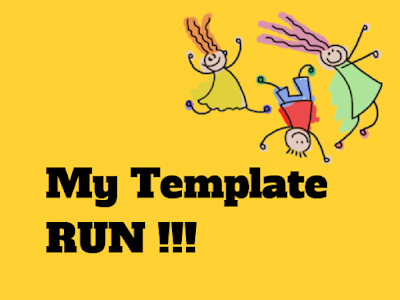 Not only the outlooking changes of your Template, but also you will make your HTML template dynamic such as Header, Post Title, Post Body, Sidebar, Footer will show generated data. You can custom logo, Blog Title, Sidebar etc through Blogger Dashboard without customizing any HTML code. 1. From Blogger Dashboard → Theme → Edit HTML and clean up all codes. Select all by Ctrl + A and DELETE or Backspace. Please put this code after </title> tag and now save your theme. “We did not find any section in your theme. A theme must have at least one b:section tag." N.B. We will discuss about this after a while. Now save the theme. Yes ! There is no notification showing now. Just relax and preview. It is showing Hello World, isn’t it? Now go to your blog URL and see what happened. OMG ! 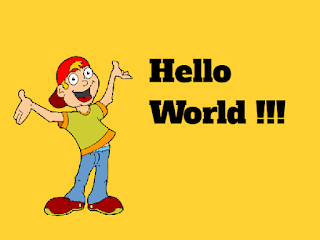 You have said Hello World through Blogger ! You have succeeded to run your HTML code ! Though it isn’t enough to create a Blogger template, but you have almost done. It is the primary and basic step. You may ask What is <b:skin>...</b:skin> tag? This is for containing custom CSS code for decorating your Blog. Lets create a new post from Blogger Dashboard → Posts → New Post and write some dummy text to see what happened in published Blog. After publishing new post, we don’t see any post and our text. You exclaimed, “What !!! Nothing to see ! Where is our post? Why this?" This is why we didn’t tell Blogger where the post will be shown. We didn’t create and select any section for blog. Not only for blog post if we want to show Header, Sidebar, Footer we have to determine those by creating sections and widgets. Instantly, copy-paste the followings codes in <body></body> tag. And save your theme. If you see the preview you will see a published post with title and post. That means, you have successfully published your blog. Now visit your blog. Obviously, you will be happy. If you reload Blogger Editor, you will see some additional codes has been auto generated. Generated code before <head> tag defines xml version and others to render this template properly. If you expand the code within blog widget you will see main, post, comment-form, share-button etc. This is for default tools that is needed when we publish post. Though you have been succeeded to publish your blog by following the above instructions, probably you didn’t understand about section and widget. Why this? You should must learn the reasons. Because it will be needed in future to create new section and widget, after all we didn’t see how dynamic sidebar, header works. Since we want to learn and make a professional Blogger theme, we should work on redesigned but full responsive HTML template that contains Header, Navbar, Main, Sidebar, Footer etc. These features are not available on our current HTML template where we are working. It will be better decision to use built in full responsive framework like Bootstrap, W3CSS, etc. But I prefer to work with Bootstrap and this blog is also built with it. You no need to download Bootstrap. Here is the ready-made Bootstrap html empty template and we will work on this template. Go to Blogger Dashboard → Theme → Edit HTML and clean up all codes from your current theme. You can backup your theme after deleting. Now paste the following Bootstrap HTML template to editor and save. Now we will work on this template and forget the previous template. :) This is our guinea pig template. We have said to show the post we created, it needs a section. Creating a section on Blogger theme is very easy. What is section in Blogger? A blogger section is a allocated space on Blogger theme to contain widgets. 1. Each section has the starting tag and ending tag. Starting tag is <b:section> and ending tag is </b:section>. After publishing post if you inspect section from browser with Inspect element, you will see a div class instead of section. But in Blogger HTML Editor the sections are not changed to div class. 2. Each section must have an unique class and id. Naming the class and id of one section to another section is illegal. Since section is converted into div, the class and id of section are remain in div as attributes. So we can customize the design of section by this class and id. 3.You are not allowed to nested of section. Under a section, creating another section is not valid. 4. You can insert only the given attributes. 5. It would be better to create section under a div. The given chart will show why, how you will use attributes within section tags. id Unique name. Only letters and numbers are allowed. 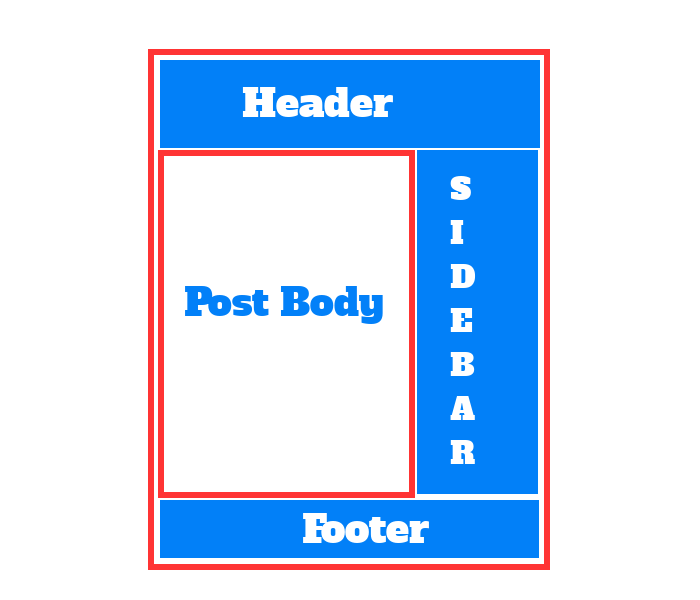 Example: header, navbar, sidebar, footer etc. Required Determining and customizing section with id. class Same as id. Optional Determining and customizing section with class. maxwidgets In numbers. Example: 1, 2, 3, 10 etc. Optional How much widgets we want to keep within this section. showaddelement Values of this are in Boolean. Yes and No. Optional If yes then the section will allow to add gadgets as widget, otherwise none. growth horizontal and vertical. Optional If vertical then section will be arranged side-by-side. Othewise stacked. What is widget in Blogger? You can use starting and ending tag in declaring widget. Starting tag is <b:widget> and ending tag is </b:widget>. Or you can use only single closing tag as <b:widget/> . After publishing post if you inspect widget from browser with Inspect element, you will see a div class instead of widget. But in Blogger HTML Editor the widget are not changed to div class. Each widget must have an unique id and a type attributes. Naming the class and id of one section to another section is illegal. Since widget is converted into div, the id of widget are remain in div as attributes. So we can customize the design of widget by this id. You are not allowed to nested of widget. Under a widget, creating another widget is not valid. You can insert only the given attributes. You must have to create widget within create section. You are not allowed to insert HTML within widget. type Header, Blog, Profile, PageList, AdSense, Attribution, HTML Required Define the type of widget. locked yes, no Optional If yes then you can't delete or move this widget. title Put any title name. Example: Tools, Advertisement, Lists etc. Optional Show the title of this widget. pageType all, archive, main, item, static, all Optional Define the page type of widget. mobile yes, no, default Optional If yes, then the widget will be shown on mobile device. Section is independent area. Dependent Page Elements that depends on Section. Each Section can hold single or multiple widgets. Widget can't hold section. Section has no attribute to control displaying or hiding on mobile devices. Widget has an attribute to control displaying or hiding on mobile devices. Section has no title attribute to display or hide any title. Widget has title attribute to display or hide the name of title. Section allows to add inner HTML directly. Widget doesn't allow to add inner HTML directly. Section can't hold another section. Widget also can't another widget. In published blog Section tag is replaced with a new div. Widget is also replaced with a new div. Each Section has unique id. Each Widget has unique id. 1. Though it is optional to name the class of section, we should add it because, the naming will help Blogger to determine how to transfer blog content when changing theme. 2. The native name of classes are ‘navbar’ for navigation menu, ‘header’ for header section, ‘main’ for post section, ‘sidebar’ for sidebar section where we put popular post, recent post, labels etc. and ‘footer’ for footer section of blog. Now create new sections and widgets, where you want to put this. Without header & blog widget, I do recommend, create all section but it would be better to no create widgets in editor, since you can add widgets from Dashboard → Layout. You can make top bar responsive navigation menu for Blogger theme as you have done on raw HTML template. Using static Navigation menu in Blogger is the best way to avoid many problems. Though you can use ‘Pages’, ‘Link list’ gadget to insert link dynamically into your menu, it will be difficult for drop down menu. So you don’t need to dynamic data as you did and will do for others layout on Blogger. If you use Bootstrap Framework, then you can use navebar from here Or you can check the actionable article about responsive menu from w3schools. we should make this dynamic so that we don’t need code again. Put the following code in header div. Put the following code in post div. Put the following code in sidebar div. Put the following code in footer div. Blogger offers some default data tags by which we can call specific data to show. Example: If we want to the name of author of published post in every post, then we can use <data:post.author/> . Use this after the following tags. Similarly, there are many Blogger data tags to show specific data in published Blog. This Blogger Data Tags will work only in Blog widget. <data:post.dateHeader/> The post's date as header. <data:olderPageTitle/> Title of the older page of posts. <data:newerPageTitle/> Title of the newer page of posts. <data:authorLabel/> It will show "posted by". <data:post.title /> The post's title. <data:post.author/> The post's author name. <data:post.url/> The post' url link. <data:post.timestamp/> The post's date and time. You can get more Blogger Data Tags from Blogger Support. What is dynamic anchor tag in Blogger? You can put the code before </head> tag or after <body> tag. Learn more dynamic conditional tags for Blogger. By this conditional tags you can target specific URL, Page etc. Now let’s go to make dynamic your Blog title tag. It is combinational of Blogger Data Tags and Conditional Tags. Replace your <title></title> tag with the following codes. Replace Blogger, Code and Ubuntu Platform with your desired title name for your blog. 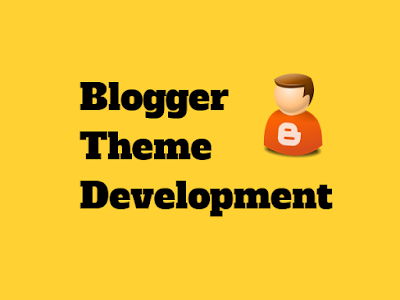 We have already finished 80% of Blogger Theme Development. The rest 20% is about custom designing with CSS. Before editing the design you should learn how to edit Blogger template. Finding all class & id of div, section, nav etc is so difficult, bored, time-wasting by manually. But I will tell you the tricks to collect all class and id with default CSS within few seconds. 1. Copy all the free CSS code for Blogger from the link. 2. Paste on to beatify or formatting. 3. After formatted copy the all CSS and paste on any HTML/CSS editor. 4. Modify CSS class and id if any have bad formatted. 5. Paste on your Blogger Theme within <b:skin> [[ /******CSS ******/ ]]></b:skin>. 7. Next customize your CSS with inspector tools from browser. Tips for Font-Awesome: You can insert Font Awesome icon as below. How to arrange Author, Labels, Date up and down from post body? 1. First go to Blogger Dashboard → Layout → Blog Posts → Edit and you will see an pop window. 2. From ‘Post Page Options’ check the button what you want to show and uncheck the option you want to hide. 3. After scrolling down you will get ‘Arrange Items’. Drag your selected item up and down to set. If it doesn’t work then move related code from Blogger Editor by manually. See this article about how to add jump break / read more button on Blogger. Add the following CSS to Blogger Theme as according to your customization. Put the CSS Into your Blogger Theme. Check the date option you want to show. See this article about how to add breadcrumb on Blogger. See this article about how to customize dashboard layout on Blogger. See this article about how to customize featured post on Blogger. See this article about how to remove errors of schema markup on Blogger. See this article about how to use Font Awesome on Blogger. See this article about how to use Google Fonts on Blogger. See this article about SEO Friendly Meta Tags on Blogger. Creating professional Blogger theme depends on how do you know code, how do you inspect element, stylesheet, how is your concept, idea to design. Though this tutorial provides the guideline to create Blogger theme professionally, your attempt & patient will define how much skilled you will be next. This is my own designed & developed Blogger Theme. How to edit position template dude? Create a new Blogger section on the position where you want to show. Before creating new Blogger section, you must be ensured of having the div space in the right of the header. Great tutorial! I have been wanted to write something similar for a long time, but on my native language. May I translate your article as a basis? Systematic demonstration that how to design a theme, great post thanks for sharing. Thank you BINDESHWAR SINGH KUSHWAHA! Your guide is just awesome. You have explained everything very well. Thank you so much. Thank you Alfaaz. Stay with us. very very thankful to you Sir you did a great job by posting this info.thousands of new bloggers will be thankful to you for this. Too much awesome and knowledgeable post thank you. One question-If I use static HTML and CSS instead of blogger way will it effect seo. No, it will not effect SEO. But blogging CMS like Blogger, WordPress will help to optimize more efficiently. 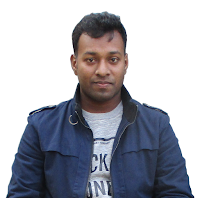 I have used Blogger for this Blog. Best tutorial ever. You are the champ, mate! Anyway, can I remake this article in Indonesia language version? I'll put your site and name on it. Why not? But put the URL with backlink of this Post at the end of your post. I am first time visitor your blog and read this awesome post. I really appreciate your work, it is very knowledgeable. Good content with good wrinting. You are using adsense very cleverly. Your template is also very good. Will you please share your template with your viewers. Sorry to say that, I can't share this Blogger Theme. It is not wisely to choose the Blogger for shopping site. You should to choose Shopify or WordPress. Hey there you tell me this guy made such an awesome blog design. This website isn't available now. Please check. How much do you take for blogger theme design. It will depend on the design you want. Please mail to contact@compromath.com for details. Just follow this tutorial step-by-step. You will find the necessary source code here. Your blog is ok. You can add custom domain. Thank you for the useful Tutorial, definitely bookmark this page. Sir I want to ask your opinion about Accelerated Mobile Page. applying AMP in blogger seems like a headache to me. If I not start learning or use AMP in blogger, will I be the only one left behind in the future, especially on google search? Or do you think that AMP is 'just a small ripple in the sea' we should not too concern that we can be succesful without AMP (especially on google search) even 5 years or 10 years later. Sorry for the weird question :D .
Welcome Daryadi Sarumpaet & happy to see your comment. Your question about AMP is very thoughtful & we must be concerned about this. 1. We should not be serious much within 1/2 years. Specially for the Blogger platform. 2. Since the objective of AMP is making website consistently fast, beautiful and high-performing on Mobile Device, we should apply this project on our Website, if the major visitors visit through Mobile. 3. Definitely, it has the impact on Google Search for the Mobile Device. which platform is better for blogging as carrier..? You can choose one of them - Blogger or WordPress. If you want to integrate e-Commerce option to your blog, then WordPress is the best. and im not make e commerce blog or i make other blogs so blogger is perfect for blogging as carrier.? If you know the basic SEO guideline, then I recommend for you to choose Blogger. Read - Blogger VS WordPress - Which is the BEST? I hope those will help you. Change the id and class of Footer with any. Then you can understand how to find all components in Main Section. Great tutorial. Can you make a video on this ?? I will try. Thanks for your comment. I would like to know from you if we can display all the post related to label , for ex : i am accessing a post and i at the same view at the left section i want list of all the post linked to that label. Is there any option to do so ? you help would be appreciated. Yes, it is possible. You can do it by showing related post widget. Search on Google for Blogger. You will get a lot of tutorials on it. The Great tutorial.. Thanks Bro! I am so happy. I have never found a tutorial as good as this before. Can I make this tutorial into languages in my country? I am from Indonesia. Thanks for your valuable comment. I appreciate you and your country's language. Definitely, you can publish by translating. But don't forget to link this page as source and also send the link of translated post. We will add this link in this post. i have a blogger slider which shows on pc but not shows on mobile. whenever we open our blog slider doesn't show but when we open our blog site on pc slider shows n works well. plz guide me what code should i use so that slider can show on mobile site. Open your Theme XML File through any Text or HTML Editor. Find out the code of your Slider. Maybe this slider is disabled for mobile device. Or Similarly find data:blog.isMobileRequest and CSS on this condition. If your Slider CSS display:none, delete this CSS.